Portfolio for JIRA provides you with full flexibility to configure the availability of team members. You can see which member is available to work on which team, and for how long. 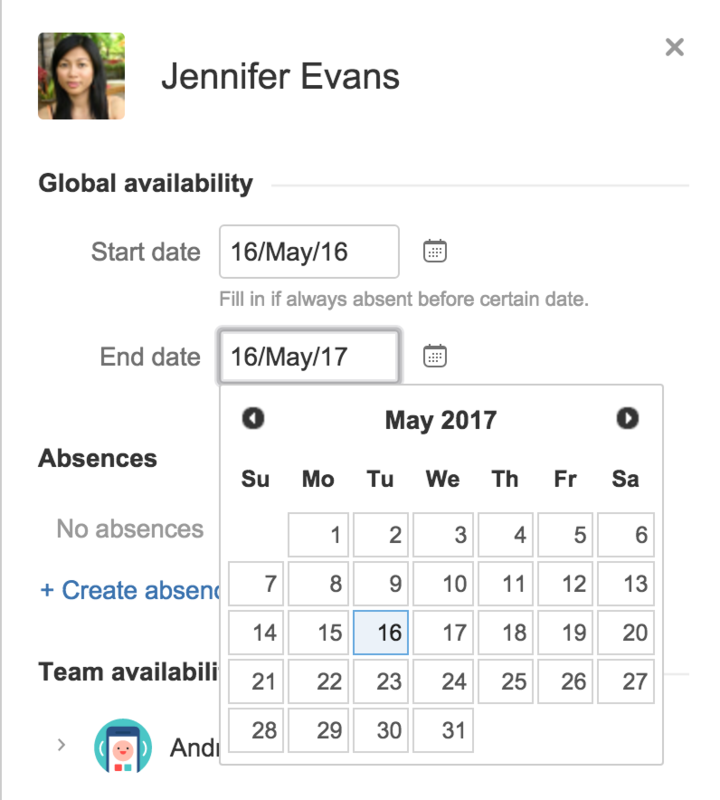 The global availability defines working hours and dates of each person across teams. Go to Portfolio > Manage Shared Teams tab, select a team and a team member. You can also go to Portfolio > Manage Shared Teams > People and select a person. Fill in the Global availability fields. 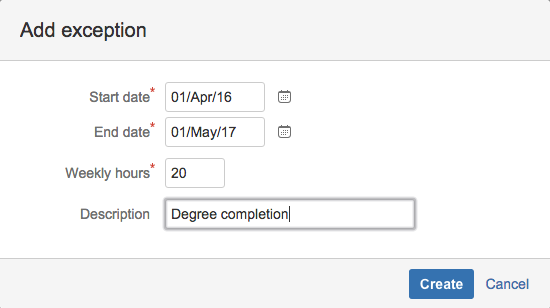 Start date at which the person is available to work. Example: The date they join the company. End date at which the person stops working. Example: Date their contract expires. Absences Dates ranges the person doesn't work. Example: Holidays, sick leave or parent leave. Once you've configure the person, you will be able to see their global availability any time by going to the Teams view and selecting the team member whose information you want to consult. A company hires a developer as a contractor for a project with a year contract duration. from 16 may 2016 to may 2017. Add a new team member to your plan. Go to Manage Shared teams > Portfolio > People. Select the person whose global availability you want to configure and edit the global availability fields. Go to the Teams view. Select the team member you want to configure. You can check the teams a person is member of by going to team Team availability section and opening the teams. Fill in the team availability fields located on the right side of the screen. Start date The day the person joins the team. End date at which the person stops working for the team. Weekly hours Weekly hours the person can work on that team. Exceptions Exceptions to the normal working hours. Add an exception to normal working hours by clicking +Add exceptions, filling the fields and selecting Create. Once you've configure the person's availability, you will be able to see their team-specific availability any time by going to the Teams view and selecting the team member whose information you want to consult. If you have configure a shared team member, you will be able to see all the shared-teams that person is available for in the shared teams page. 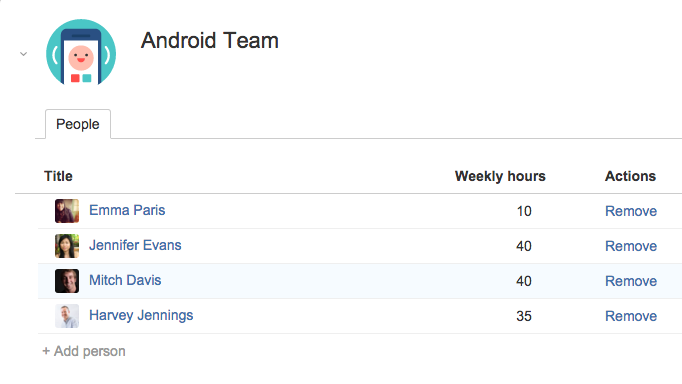 Mitch Davis is a developer in the Android team. He will be working half days during the year starting on April the 1st 2016 and you need to modify his weekly working hours to adjust the team's capacity. Go to your plan > team view. Select Android Team and the team member Mitch Davis. In the Exceptions section, click +Add exception and fill in the fields. Click Create once you're ready.